As if trying to figure out which company owns which distillery wasn’t hard enough, Glenrothes waltzes in and throws another curveball to muddle the issue even more. One thing seems fairly clear; in 1887, Glenrothes was owned by a company called Highland Distillers. After that, things get confusing as hell, at least to me, my small-ish brain and my cursory, impatient, half-assed research. Apparently, Highland Distillers was a merger between William Grant & Co., the owners of Glenrothes, and the Islay Distillery Co., who owned Bunnhabhain. Now, I know what you’re thinking, but you’re wrong, that was NOT the same William Grant that owned Glenfiddich. You might find the interwebs say differently on occasion, but they also say that Glenrothes’ William Grant died in 1905…Glenfiddich’s William Grant died in 1923. So there you have it. See, confusing, and we haven’t even arrived at the confusing part yet. In the middle of the 1900’s, a volley of business transactions, incomprehensible except by those with the stamina to stay awake long enough to earn business degree, saw the ownership of Glenrothes stay with Highland Distillers yet also somehow change over to the Edrington Group, which had roots in the Robertson & Baxter company, which originally owned the Islay Distillery Co., which of course help establish Highland Distillers back in 1887. In recent years, Glenrothes was still owned (along with Glenturret, Highland Park, Macallan, and the Famous Grouse) by the Edrington Group and that all seemed pretty straight forward until 2010. In that year, they acquired the Cutty Sark brand from Berry Bros. & Rudd in exchange for the Glenrothes brand, yet the Glenrothes distillery continues to be owned by the Edrington Group. So there you have it, in a sense, one company owns Glenrothes and another company owns Glenrothes. I’m sure it all makes sense somehow, and somehow someone is hopefully making a lot of money with it all, but for feeble-minded whisky bloggers who like their tales of ownership somewhat neat and tidy, this is a twisted tale. Luckily, the booze is fairly straightforward. 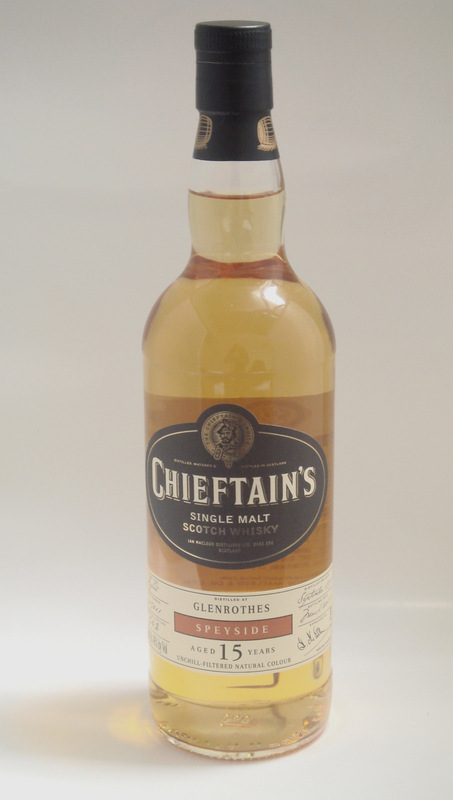 Distilled in 1997 and aged for 15 years in a re-fill hogshead, this expression from Ian Macleod’s Chieftain’s range has not been chill-filtered nor has it been artificially colored. The Palate: Oily and sweet to start, with continued jammy fruit and even more citrus – Meyer lemon and orange zest. Nutty toffee, vanilla bean, and chocolate-y malt quickly become spicy, leading the way to those same rich woodspice notes. Quite tannic and dusty with more polished oak, cinnamon, soft clove, a bit of nutmeg, and a hint of tobacco leaf. The Finish: Long with more vanilla, dried orange peel, dusty, drying tannic fruit and soft cinnamon. Thoughts: Delicious stuff. There wasn’t really anything unexpected or terrifically unique about this one, but that did not take away at all from the rich, sweet nose and lively, spicy palate. There’s a nice progression through the early dessert notes through to that dusky, tannic finish, and while it does get rather spicy towards the end, it never seems out of balance. At around $80, this is more or less in line with similar vintage-d distillery bottlings which makes it a decent value, especially if you’re a Glelnrothes fan. Recommended.